Last year for the holiday season, I made a No Bake White Chocolate Cranberry Cheesecake as part of the 12 Cakes of December series. I joined 11 other food bloggers and we each took turn to make cakes that we felt best represented the season. I wanted a truly festive and lovely cake so I chose to make a cheesecake with cranberries – since cranberries have a deep red hue which of course is the color of Christmas. Besides, I truly love cheesecake! For this year, I thought I’ll make another version of Cranberry Cheesecake. This one would be a baked version and with a homemade cranberry sauce. I served this last week to some friends who came over for lunch and they gave it a good thumbs-up! I truly love it, too. 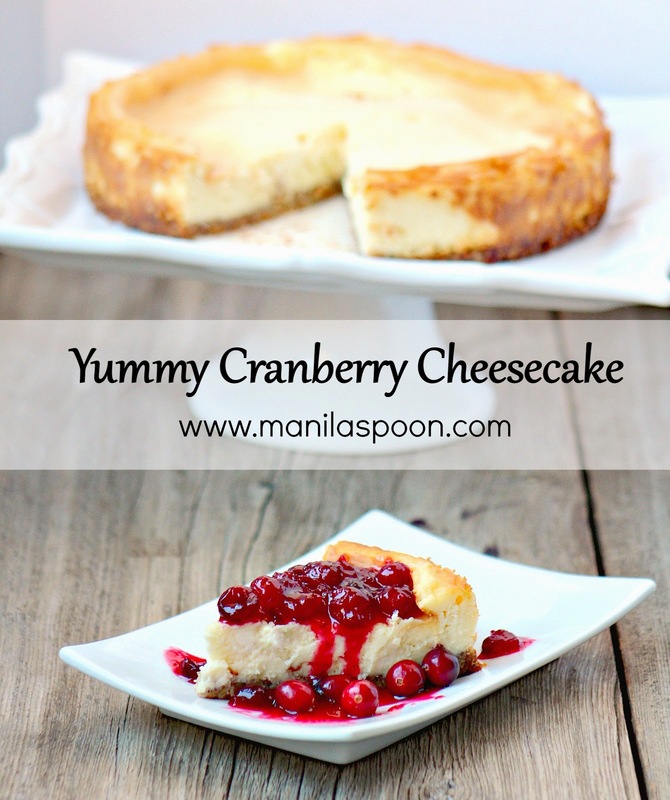 The sweet-tangy taste of the homemade cranberry sauce provided a nice contrast to the creamy cheesecake. You bite into a rich and dense cake and then your taste buds are also treated to the fruity tang of the cranberry sauce. What a perfect explosion of flavors that are truly unforgettable. If you are still in the process of considering what to serve as dessert for your gathering this Christmas, I do highly recommend this one. But if you don’t fancy baking then I most highly suggest that you try our No Bake White Chocolate Cranberry Cheesecake version as that one is equally luscious! Please enjoy. To make the crust, combine all the ingredients in a bowl and mix until evenly moistened. Press the crumb mixture into a greased 9-inch springform pan using the smooth bottom of a glass. Set aside. Using an electric mixer, beat the cream cheese in medium speed until soft, creamy and no more lumps appear. Frequently scrape the sides of the mixing bowl to ensure that there are no lumps remaining on the side or at the bottom. Add the sugar slowly and continue to beat until the mixture is smooth. Add the eggs one at a time (this is very important) beating well after each addition. Pour in the vanilla extract and beat again just until the extract is well mixed. Do not overmix at this point. Patience is the key here – it may take awhile to do all the above but the result would be a very silky smooth cheesecake and not a lumpy one. Pour the cheesecake batter onto the prepared springform pan. Bake in the preheated oven for 50-60 minutes. The cake may brown on the edges and may even crack on the middle but that’s perfectly fine. If you don’t like the appearance of cracks, try to bake the cheesecake using a water bath. I don’t worry much about this as the cheesecake (or each slice) would be covered on top with the sauce anyway. Besides, the browning, sinking or cracking won’t affect the cheesecake’s taste one bit. When done, transfer the cake to a rack and cool completely. Refrigerate. The cake can be done two days ahead. To serve, transfer the cheesecake to a serving platter. Spoon the cranberry sauce onto each slice of cake. Enjoy thoroughly. In a saucepan over medium heat, combine the water, sugar and ground cinnamon. Cook while stirring until the sugar is dissolved. When the mixture comes to a boil, add half of the cranberries (1 cup) and cook until they begin to pop. Stir in the remaining cranberries with the cornstarch and continue to simmer until thickened slightly. Remove and cool. Spoon on top of the cake slices when ready to serve. This is just a perfect cheesecake! The addition on top with the homemade cranberry sauce is marvelous. I'm looking forward to giving this a try! 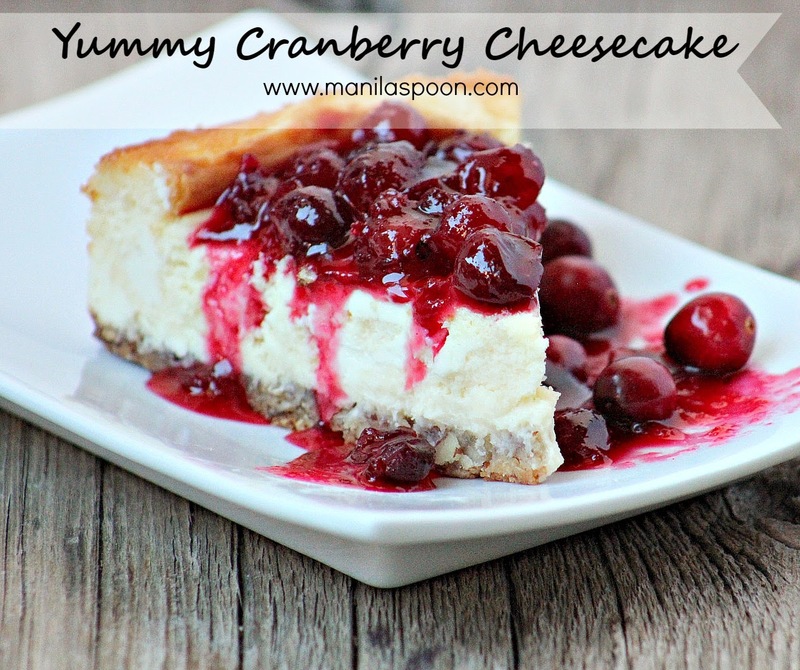 Cranberries and cheesecake sound like an amazing pairing! Cheesecake is my daughter's favorite dessert. She would absolutely love yours. 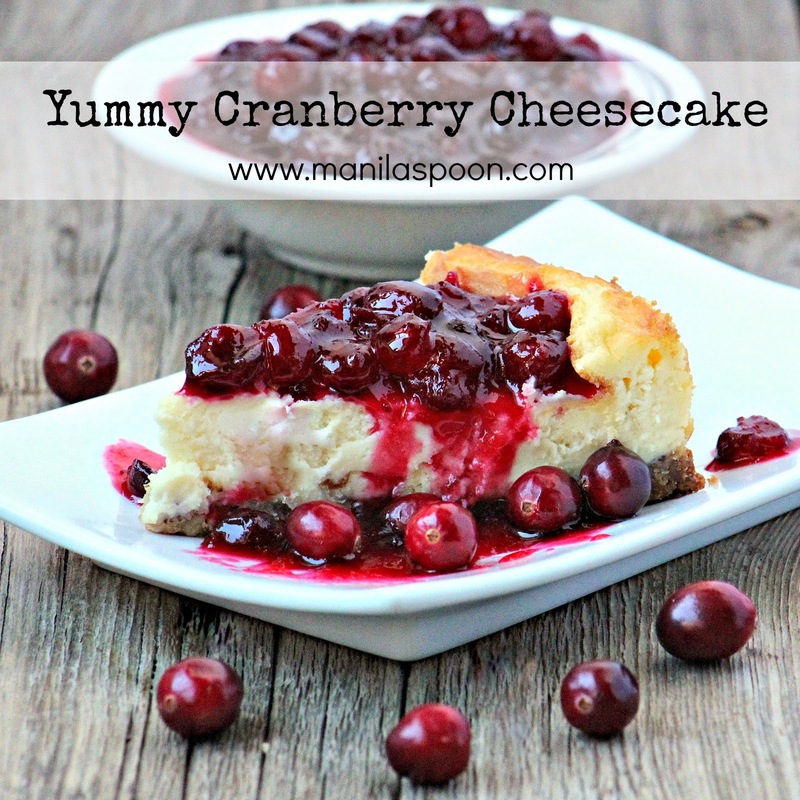 I love cheesecake but never thought to use cranberries for the sauce. Great idea! Lovely dessert! Pinning it for the holidays – what a creative way to use cranberry sauce. I'm drooling over my screen. This looks so so good – and perfect for the season ahead! 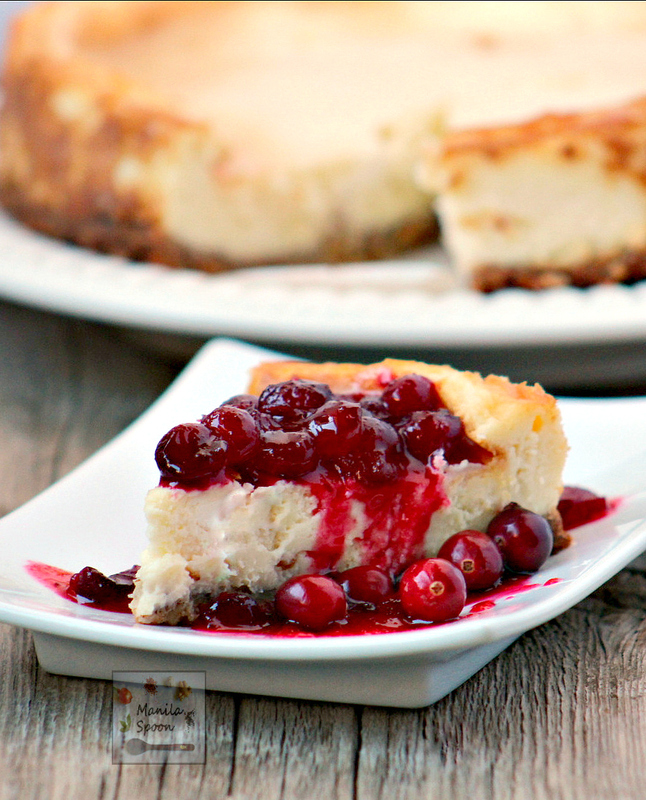 I love cheesecake and the texture of this baked cheesecake looks so delicious! What a pretty dessert. I love cranberries and this would be the perfect replacement for the cranberries I serve at my table on Thanksgiving. I know this would be a hit. This looks beautiful and I bet it is outstanding! Pinned for later! Such a beautiful cake – and with the tart cranberries setting off the rich cheesecake, it shounds incredibly scrumptious.